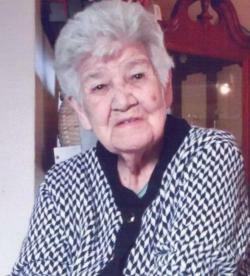 Surrounded by her family, Mary Audrey Francis of Tobique First Nation, NB, passed away peacefully at the Victoria Glen Manor on Sunday, January 13, 2019. Audrey was born at Tobique First Nation, NB, on October 24, 1930. She was the daughter of the late Frank and Vina (Ennis) Sappier. Audrey leaves behind her children, Wanda Sappier, John Sappier (Denise), Dora Sappier, Erin Sappier (David Perley Jr.), all from Tobique First Nation, NB, Patti Sappier of Oromocto, NB; her step-children, Kim Francis of Tobique First Nation, Penny Watson (Scott) of Currie Siding, NB, Billy Francis (Kim) and Peter Francis, both from Virginia; 28 grandchildren, 54 great grandchildren, 10 great great grandchildren; along with several nieces and nephews. Audrey was predeceased by her parents; her husband, Burton Francis; her sons, John and Earl Sappier; her daughter, Darlene Boyington; her granddaughter, Kara Sockabasin; her sister, Nancy Francis; and her brother, Loomis Sappier. Funeral service was on Thursday, January 17, 2019 at 2 pm from St. Mary of the Angels Catholic Church. Father Gilbert Doddatto celebrated. Interment will be in St. Ann's Catholic Cemetery at a later date. Music for the service was by organist Tracy Hamilton and St. Ann's Church choir. The eulogy was given by Danielle Sappier. Pallbearers were Tyron Nicholas, Dustin Sappier, John Sappier, Bennett Sacobie, Eric "Bubba" Michaud, Frankie Lewey, Thomas Lewey, and Edward Perley. Audrey's family would like to offer their heartfelt gratitude to the staff of the Victoria Glen Manor for the professionalism and compassion given to Audrey during her stay with them.